The Hospital for Sick Children is Canada’s most research-intensive hospital. SickKids are innovators in child health and work to improve the health of children by integrating patient care, research and education. Improving the lives of children is SickKids focus and they are the largest centre dedicated to improving children’s health in Canada. In May 2012, SickKids launched its first-ever Healthy & Happy campaign in support of kids’ health by putting a positive twist to what can be a very difficult time for people. SickKids asked people from communities in the GTA to stand up and Do The Happy to give thousands of children a better chance at a healthy and happy life. Fervent Events was happy to be part of this exciting campaign and helped launch the day. Do The Happy launched in May 2012 and took place at Nathan Phillips Square. Hundreds of people attended the launch where Fervent Events created three experiential activities. Happy Mural; This was created on site by well wishers posting positive messages on a mural to be placed in the hospital. Happy Mail; People of the community filled out cards with uplifting messages, which were then mailed in our onsite post box and the ‘delivered’ to passersby by Fervent Mailmen. Toronto’s Largest Happy Face; People of the community were asked to come together and create a giant human happy face which was visible from the sky. Fervent Events coordinated 400 people on the ground for a media photo op from the 43rd floor of the Sheraton Hotel! 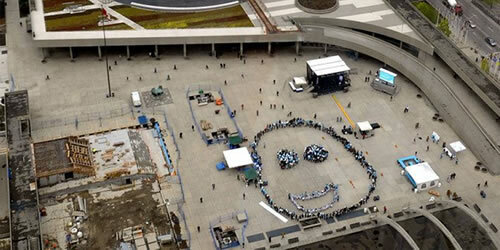 Created Toronto’s largest human happy face using over 400 members of the community. The event was covered by National TV and newspapers in the GTA. Happy Mail cards delivered to the public to promote “Do The Happy”. Happy Movement Mural with positive messages was displayed at Sick Kids Hospital. Click here to view the making of this fun mural in our video time lapse.